Enewall have been manufacturing and designing products and systems for the construction industry for over 25 years, Enewall’s experience and knowledge lies within three key areas, render, external wall insulation systems and steel framing systems. Enewall Render offers a weather resistant decorative finish to new or existing facades, Enewall specialise in traditional and polymer enhanced base coat and top coat renders. We also offer a wide range of decorative finishes from; traditional dry dash, wet dash, acrylic and silicone enhanced finishes. 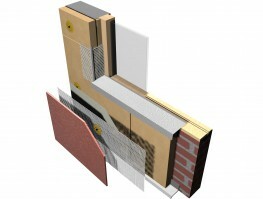 Enewall render systems are suitable for new build and refurbishment projects. Enewall’s external wall insulation systems bring together the company’s expertise in developing easy to apply renders combined with leading makes and types of high quality insulation to conserve energy and steam heat loss. Enewall’s Steel framing system is Light gauge steel framing commonly used for Structural framing, Infill panels and Over-sail system. Enewall guarantee expert design and cost effective solutions for a wide variety of projects. Technical, structural and design attributes allow a single solution from concept to completion on projects with the customer in mind. The maximum length of section is limited to 15 metres although, in practice, handling and transport considerations usually dictate the maximum length of the section. Enewall offers its client an extensive range of supporting services including; Technical & On-Site support, Architectural & Design Services, List of Approved Installers trained by in-house Technical Team as well as Product & System Warranties.